No one wants to be the innkeeper in a Christmas pageant. You know the one, the door-slamming landlord who turned away Joseph and Mary before they became the Holy Family. Any other role is better than that one. Even wearing the scratchy sheep costume is better or being the rope pull on the flying angel—anything but the mean innkeeper of Bethlehem. The Latin American tradition of las posadas gives participants a chance to be better than the original host. For several nights before Christmas, groups accompanying children dressed as Joseph and a pregnant Mary travel from door to door looking for lodging. The procession can feature lanterns, singing, a donkey and a whole lot of adorable kids dressed in biblical costumes. On these nine nights, the holy couple is welcomed inside, and festive foods like tamales and atole are served. The community gathers and ritually rewrites the Scriptures, this time welcoming the strangers in from the cold. But even if las posadas is not part of your tradition, this Christmas we can all do better than the innkeeper who shut the door. Many of us will be gathering with family and friends for Christmas Mass. And, as usual, we will be a mixed group made up of those who get to Mass regularly and those who do not. Our experience of Christmas Mass is going to be different depending on our place in the mix. For the regular Mass-goers, it will seem homey and routine, and a nod of recognition is going to be enough. And for those who call the particular parish home, Christmas is the chance to welcome the stranger, to be the good innkeeper and not the bad one. And who knows, the welcome you extend to the infrequent Mass-goer might be what brings that person into community. And next year you both will be welcoming a new stranger together. Unlike Mary and Joseph, the contemporary stranger is going to check out the local parish online. And the Christmas Mass times have to be prominently featured on the front page of the website. Boom, right there. And if you really want to get the bonus points for hospitality, you could do a front page link to a “What to expect” guide for newcomers. People want to know how long Mass is going to be, as well as the style of music. Easy to do, with big impact not only on Christmas but all year long. If you do not already have a page like this at your parish, see if you can make it happen. At the doors of the church, a parish can have well-trained, friendly people greeting everyone, letting them know where the bathrooms are and handing out thoughtfully composed guides to worship. These guides can include music and lyrics that will help everyone sing and will avoid intrusive announcements from the choir director. Including the text of prayers that strangers might not have memorized is another act of hospitality. That means including the Creed and any other spoken prayers. Christmas Catholics will appreciate being looked after. When deciding what to include in the Christmas worship guide, it is worth trying to imagine the reasons this stranger has not been to Mass in quite some time. If the parish has a social justice group, list it; if there is an L.G.B.T. Catholics group in your parish, mention it. Financial transparency might make an appropriate appearance. And yes, if there is a contact for reporting clerical abuse, list it. Many parishes are deeply involved in vital human issues, and this is the time to mention them. People, especially new ones, read these worship guides and make choices in light of what they read. Finally, if your parish has a program to welcome Catholics back into the faith, list it. With an eye to the stranger’s next step, parish contact information and the regular Mass schedule should also be included and not relegated to a separate bulletin. But not everything has to be crammed into the aid to worship. An announcement from the pulpit before Mass can go a long way toward making people feel welcome. At that point let people know the parish custom around reception of the Eucharist in the most carefully worded way possible. Be aware that people are sensitive to the slamming of a door throughout the liturgy, not just at the physical front doors of the church. This can happen when the pastor makes a sideways remark about the crowd of unfamiliar faces or blithely remarks he has not seen many of them since last Christmas. These wry comments about Christmas-and-Easter Catholics can go very wrong, and people feel called out, criticized and confirmed in their reasons for avoiding the church in the first place. Finally, if you are at your local parish, just as you were on the Sunday before Christmas, and if you are sitting in your usual spot, keep an eye out for a stranger looking for a seat. Be the family who makes room for strangers. Be the good innkeeper, the one who chose the stranger, the one who did what she could to help bring the Savior of our world into the world. Thank you, Fr. Bentz. I am neither an Easter nor Christmas Catholic, rather a "Cradle Catholic." Nonetheless I identify mself as Catholic. The Church is in a mess, as you correctly observe--and has been for many years. Your words give me hope that I may once day be able to return. Thank you again--from the heart. Really great article. It also makes me a bit upset when priest are quick to make jokes about the guests who come for the first time or return after several years. Thank you also for including LGBT on your article. If only more parishes were able to hold socials n support groups for LGBT Catholics. What mom hasn't dealt with the kid who drew the scratchy sheep costume? How many of us have been annoyed because somebody unfamiliar was in "our" pew or seat? Uh huh. That's why this article was not only funny, but perfect. Because we all need reminding that sometimes we are the known ones, but at some point we'll all also become "the other". We could do so much better in knowing that God dwells among, and within, each one. You offered excellent, concrete, do-able suggestions. Thank you, and may this Holy season bring you many blessings. True story: I first heard the term "Chreaster Catholic" from our pastor...at Christmas. A lot more needs to change before any Thinking Catholic becomes a pewsitter donor again, a lot more. 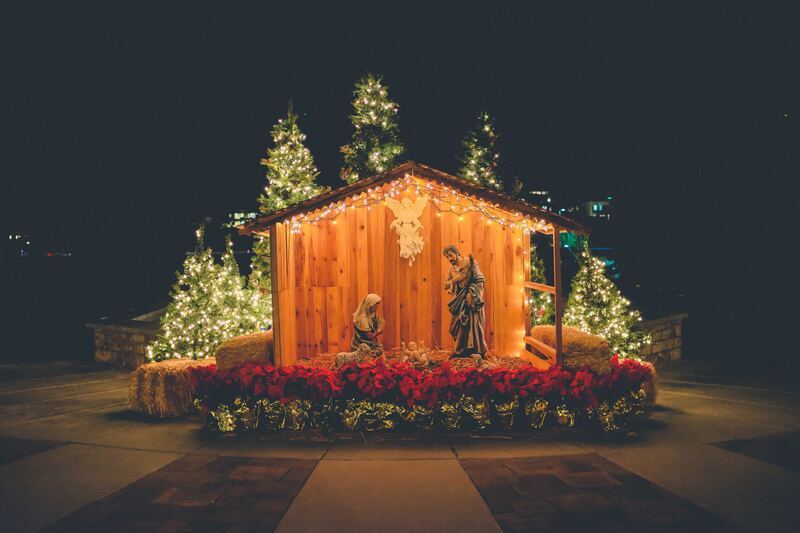 At the time of Mary, Joseph and Jesus the stable in winter, for its warmth, was an upscale accommodation at an inn. That innkeeper kindly gave them the best room in the house, no doubt out of consideration for Mary's pregnancy. But I am sure that the innkeeper, and God, forgive all the Catholics through the ages who have maligned that innkeeper. No, you do not get it Father. Great article! I spent Thanksgiving with relatives in a far distant parish. Though that church had been through Hurricane Harvey and was partially still damaged, the mindfulness and hospitality of the greeters/staff to a handicapped stranger (me) still shines in my memory. I think that mindfulness is a good starting point for Christmas services. And, if there is ONE time of year when the homily should be carefully prepared with the thought that there will be visiting family members at all stages of relationship with the Church--this is it! A new theology is required. The present liturgy is soaked in guilt associated with the outdated irrelevant Atonement/redemption theology which virtually no one buys. This article also appeared in print, under the headline "The Good Innkeeper," in the December 24, 2018 issue. Jack Bentz, S.J., lives in the Bronx and works with the Jesuit Conference of Canada and the United States. He previously served as the director of the Catholic Student Center at Boise State.